Software Defined Networking (SDN) provides a whole new toolset for solving network problems. But these new tools will only generate the desired results when placed in the hands of those with the skills to use them wisely and who understand how these new tools impact the way network problems are solved. This course is intended to provide hands-on experience with key SDN tools, techniques and problem solving methodologies, using nothing more than standard PC and online resources. The Core OpenFlow Technical Training is NoviFlow training on setting up, managing and leveraging the capabilities of high-performance SDN switches based on programmable match-action pipeline technology. Why an online course using a virtual environment on PCs? Only two technologies implement the OpenFlow 1.3/1.4/1.5 specification at a high-compliance level – NoviFlow’s NoviWare NOS and the x86 Based Open vSwitch. Consequently, OpenFlow 1.3+ code developed in one environment will run in the other environment. This course leverages this compatibility to provide core skills training OpenFlow development on the widely-available PC environment. The knowledge acquired and code developed transfers directly to NoviFlow’s globally deployed NoviWare commercial switch environment. By being delivered on standard PC tools, the course provides a solid foundation for higher level courses provided by NoviFlow that focus on specific capabilities of NoviFlow’s NoviWare NOS and NoviSwitch high-performance OpenFlow forwarding planes. This course is designed to enable students to acquire the core principles of an SDN/OpenFlow match-action pipeline technology by reading modules, installing tools, completing a series of assignments, and passing skills assessments. Students are assumed to have basic expertise in Networking and Python programming, and will additionally acquire multi-table, large rule-set system architecture skills. The course embeds how to program OpenFlow switches within the broader context of crafting an SDN algorithm. 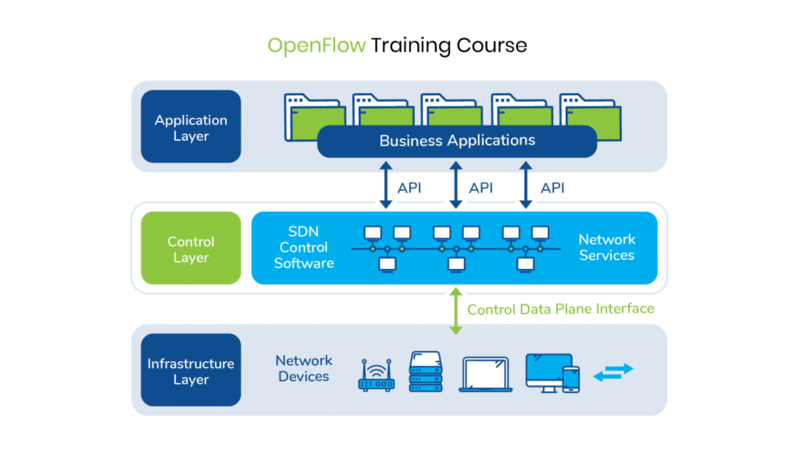 It presents OpenFlow switches, OpenFlow controllers, and OpenFlow applications working together to create, deploy and manage SDN-based network solutions. The course covers two multi-table OpenFlow applications in detail. Course Sections provide step-by-step walkthroughs for major design topics such as Pipeline Modeling, Event Driven Programming, Event Emitting Data Structures, moving a Network “State” from the Controller to the Switch, and using a REST Interface to probe a switch’s internal Pipeline. The Course Section outline at the end of this datasheet provides the Overview, Technology and Topic, plus Learning Outcomes for each Section. The Course is delivered online so that students can progress at their own pace. It is instructor moderated. Any questions can be directly communicated to the Course Leader. You will get help if you get stuck. The course also walks the student through the construction of an x86 based Virtual Development Workspace that is consistent across x86 PC and compatible with NoviFlow switches.